Also known as the “white-bark raspberry” the blue raspberry is known for its delicate blue skin and equally delicate sweet taste. Which makes it comparably the Jazz music of muffins. The subtle tones and improvisational nature of nature have created jumping masterpieces of tasteful tongue tunes. Frank uses his experiences from his jazz days playing mixer in a four piece bakery to bring you a jubilant and smooth mood muffin. 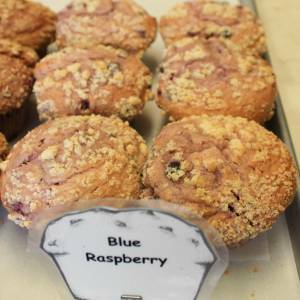 It was the favorite muffin of Miles Davis, Thelonious Monk, Dave Brubeck, and F. Scott Fitzgerald.